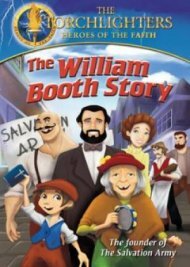 Introduce children to the action-packed story behind The Salvation Army. William Booth is determined to bring life-changing Gospel to Londons most troubled neighbourhood, the East End. But when the local pub owners realise some of their best customers are becoming Christian, they hire big, strong thugs to get rid of the preacher once and for all. Watch as Williams ragtag band of followers marches into the East End with Bibles and Prayer as their weapons of choice. Inspiring story for children and parents alike! Torchlighters: The William Booth Story DVD was published by Vision Video in November 2011 and is our 16711th best seller. The ISBN for Torchlighters: The William Booth Story DVD is 501409D. Be the first to review Torchlighters: The William Booth Story DVD! Got a question? No problem! Just click here to ask us about Torchlighters: The William Booth Story DVD.